Making a return for his third single release shot on Hive Audio, alongside many remixes and compilation features that is SOAME. For his latest outing, the „Honey EP“, the prolific Zurich-based producer teams up with Animor on vocal duties, delivering good vibes and proper deep grooves for dancefloors worldwide. 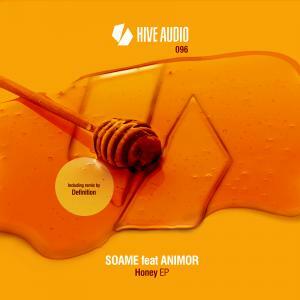 The original version of the title track „Honey“ brings on pure vibes and late night mystique, meandering in between Deep- and TechHouse, providing a untouched naturalistic atmosphere, progressive, spatial bass works and – as it tunes' center piece – a set of ever floating, ethereal vocals delivered by Animor which makes the tune stand out in every selection, especially due to its tender, caressing and beautifully stretched breakdown sequence. Definition on remix duties transfers „Honey“ to a playful, caressing early morning level, adding large scale panoramic strings and intricate, interweaving melodic elements perfectly matching Animor's distinct vocals and turning this remix into a tune to play throughout the very minutes before sunrise, sending entire dancefloors to ecstatic heavens filled with nothing but love. Finally „Honey (Dub Version)“ strips the tune of most of its vocals, mainly focusing on SOAME's on point melodic production values for a shimmering variation of the main cut, bringing forth massive, powerful, yet carefully crafted arrangements for overwhelmingly emotional moments on the dancefloor.